(CNN) — An eco-friendly building material might have saved some of the 80 homes destroyed in a recent wildfire in Southern California. But it can’t be used there. Rajesh Kanwar built his Alpine, California, house out of AAC after his previous house burned down. The masonry material, called autoclaved aerated concrete or AAC, can withstand a 2,000-degree fire for four hours, according to Underwriters Laboratories’ test results. A sort of concrete bread, it’s full of tiny air pockets, making it one-fifth the weight of traditional concrete, which means more can be transported with less use of fuel. Workers can cut it and shape it with hand tools, and its thermal qualities significantly lower energy use, experts say. “In my opinion, testing done by me and others has demonstrated that ductile shear walls of AAC can safely be used anywhere in the U.S.,” Klingner said in an e-mail from Venezuela, where he was giving a lecture on the seismic resistance of masonry. Ductile shear walls are walls that flex slightly to resist lateral force, the main cause of damage in earthquakes. My Note – Apparently, according to this CNN article – the state of California will not allow this material to be used in buildings and homes until extensive seismic tests have been done on it. But, this material has been around for years and the testing along with its approval has not been completed such that it can be used. And yet, wood can be used which definitely doesn’t have the capacity to withstand seismic forces. Who is running the government in California? Whose side are they on – it obviously isn’t the side of citizens nor is it on the side of public safety or they would encourage the use of this and other similar building materials. Any government that costs as much money as it does in California, should damn sure be doing a better job than that. Have you applied for a loan modification or refinancing under the Obama administration plan? Did you run into roadbloacks or were you able to avoid foreclosure? E-mail your story to realstories@cnnmoney.com and you could be part of an upcoming article. For the CNNMoney.com Comment Policy, click here. Real estate investors are flocking to Motor City for bargain housing prices. NEW YORK (CNNMoney.com) — As Detroit home prices in Detroit crash, sales are heating up. But with all of the plant closings and layoffs, who’s buying? Investors — some of whom are snapping up five and 10 houses at a time. HARTFORD, Conn., June 11 (UPI) — The U.S. Postal Service in Connecticut said was exploring a variety of factors to decide which of up to 150 branch offices it would close in the fall. Nationally, the volume of mail the postal service handles peaked in 2006. But, the number of items dropped from 204 billion to 203 billion in 2008 due in a large part to competition from the Internet. MINNEAPOLIS, June 8 (UPI) — A Minneapolis man said he was preparing to leave his foreclosed home for the last time when contractors boarded up the house with him still inside. Ted Poetsch, 53, said he was finishing packing and loading his cat into its carrier May 12 when he heard drilling coming from the frame of his front door, the Minneapolis Star Tribune reported Monday. Poetsch, who walks with a cane, said he descended the home’s stairs to find the contractors had already completed boarding up the house without making sure there was nobody inside. Published: June 11, 2009 at 5:37 PMDANVILLE, Va., June 11 (UPI) — A Virginia police chief said an officer followed regulations when he shot and killed a miniature dachshund that growled and ran at him. Danville Police Chief Philip Broadfoot said the officer, whose name was not released by police, encountered the 11-year-old dog while serving two outstanding warrants to a neighbor, the Richmond (Va.) Times-Dispatch reported Thursday. And, the video of the 72-year old woman being tazed by a police officer for back-sassing him during a traffic stop. Then charged her with resisting arrest which she shouldn’t have been charged with anyway because it was a traffic stop and she simply refused to sign the ticket. Do the superiors in the police department ever realize that what their field officers have done is just plain wrong? Are there ever any real consequences for police brutality in this country or is it the question of bragging rights for tazing, beating or killing someone in the line of duty that overrides all other considerations? 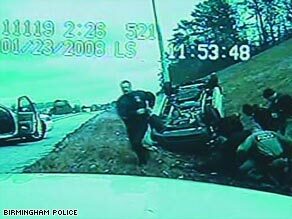 (CNN) — Five police officers brutally kicked and beat an unconscious suspect after a high-speed chase through Birmingham, Alabama, in an incident caught on camera and discovered a year later. Video shows one black and four white officers beating and kicking unconscious man ejected from car. The dashboard-cam footage, which officials believe was shot in January 2008, was aired for reporters Wednesday. It showed the end of a 100-mile-an-hour police chase of a van driven by Anthony Warren, suspected of illegal drug activity. A police mug shot taken five days after the beating was posted on the Web site of The Birmingham News. It shows a badly bruised man wearing a neck brace. Police Chief A.C. Roper told CNN that the video was brought to his attention in March by the district attorney’s office, which stumbled upon the footage as it was preparing for Warren’s trial. My Note – how could this have been missed and never known by the commander of the department from January 2008 until March 2009? How is that possible? CARROLL, Ga., June 11 (UPI) — A Georgia man said he received a phone call saying the three-bedroom house his father built had been successfully demolished — by mistake. Al Byrd said he was shocked when the Marietta demolition company told him the Carroll house, which was vacant but filled with family heirlooms, had been destroyed, the Atlanta Journal-Constitution reported Thursday. (My Note – I’m guessing they meant either Carroll County, Georgia or Carrollton, GA. since Atlanta Journal Constitution doesn’t get out much and may not know there is anything outside of I-285 which runs in a circle around Atlanta. We have a standing joke about telling people coming from other places to get on 285 until it comes to an end, then hang a right. Several times around and about three hours later – 1. they get off the freeway and ask somebody, 2. buy a map and realize it is a circle, or 3. they run out of gas and the highway hero truck tells them its not going to come to an end if they keep on going thataway, while filling their gas tank with a few gallons of petrol. *I’m not sure if the Atlanta Journal-Constitution lets their reporters out of the building anymore because of that . . . It’s probably best, anyway. If they found out how close they are to Alabama, they’d likely leave Atlanta and go home. BOSTON, June 11 (UPI) — Boston real estate officials said an anonymous buyer set a city record by paying $300,000 for a private parking space. Listing Information Network, which tracks the real estate market in Boston, said the price tag makes the spot, located in the upscale Back Bay neighborhood, the most expensive to be sold in the city, The Boston Globe reported Thursday. Debra Sordillo, the Coldwell sales agent who handled the parking spot account, said the original asking price of $250,000 was driven up by a bidding war that brought it to the record-breaking $300,000 total. My Note – there you go, first its domain names being snapped up and resold for millions each and now a parking space brings $300,000. Oh yeah, and the vanity license plates that say “I’m number1” or “I’m No.1” and “The Boss” or “Rich Guy”, etc. bring in hundreds of thousands each also. Now think about it. When I was growing up, nobody said that when I wanted to create a business, look at buying parking spaces or names of things. Nope – that was not suggested in the books I read. Nothing I read suggested the sound of a phone’s ring would make enough money to live comfortably. Nope, wasn’t even on the menu. Nevada stayed at the top of the foreclosure rate rankings by state, with one in every 64 housing units getting a foreclosure filing. California, Florida and Arizona, Michigan, Georgia, Colorado, Idaho and Ohio were the other states with the highest foreclosure rates. Ten states, led by California, accounted for almost 77 percent of total number of foreclosure actions in May. NEW YORK (Reuters) – U.S. mall operators have to work with their tenants and make concessions if they want to avoid more store closings to avoid feeding a cycle of vacancies, a retail real estate expert said on Wednesday. “It’s inevitable there will be a consolidation of the shopping center market,” Nina Kampler, executive vice president at Hilco Real Estate, told the Reuters Global Retail Summit on Wednesday. The economic crisis has swept away a number of U.S. retailers such as electronics chains Sharper Image and Circuit City, jewelry and housewares chain Fortunoff, and department store Mervyn’s. But now it is hitting retail landlords such as: Simon Property Group Inc (SPG.N), Developers Diversified Realty Corp (DDR.N) and bankrupt General Growth Properties (GGWPQ.PK). LONDON (Reuters Life!) – A newly divorced British millionaire plans to hand over his mansion, sports car and boat to the winner of a “beat the credit-crunch blues” competition. London banker Andrew Paul is charging entrants just 20 pounds ($32.81) for the chance to win his 1.1 million pound fully furnished house, a racy Aston Martin, a motor boat and an additional 85,000 pounds to cover legal fees. Or the winner can opt for 1 million pounds in cash. The competition launched on his website – www.winanewlife.com – challenges entrants to place a computer-animated golf ball on a photograph of Paul swinging his club. The person to place the ball in — or nearest to — the correct position before the competition closes on August 19, will walk away with first prize. Paul told Britain’s Telegraph newspaper that the competition’s proceeds could provide him with the basis for a new life. The competition conditions state that a maximum of 200,000 tickets will be sold. That could raise a potential 4 million pounds. If less than 150,000 tickets are sold, Paul reserves the right to retain the house, car and boat, and offer the person deemed the winner a cash prize of between 10,000 and 1 million pounds instead. SAN FRANCISCO (Reuters) – California’s government risks a financial “meltdown” within 50 days in light of its weakening May revenues unless Governor Arnold Schwarzenegger and lawmakers quickly plug a $24.3 billion budget gap, the state’s controller said on Wednesday. Fortune’s Andy Serwer says the Times can’t find buyers for the Boston Globe and its stake in the Red Sox. Another option is to work with local nonprofits to sell rehabbed units to credit-damaged – but worthy – buyers. These organizations identify families and offer them credit-repair counseling and assistance finding an affordable financing so that they can buy the investors’ rehabbed properties. “We shifted away from speculative investing into restoring affordable housing,” said investor David Butler, who buys through Burgess. The deals are often structured like a lease-option contract, with the tenant/buyers paying rent on the property plus a premium charge that is applied to the future sale price. They buyers complete the purchases when they get affordable mortgage loans. To keep costs down, Butler looks to pay no more than $45,000 for a property, including repairs and any back taxes. When finished these homes typically appraise for about $80,000. Because his company partners with a nonprofit, it accepts narrower margins, about 12%. Normally, buy-rehab-flip investors prefer margins of 35% or more. My Note – very nifty.